Browsing: / Home / 2012 / October / Will the next Silicon Valley please stand up! Will the next Silicon Valley please stand up! WeÔÇÖve been thrilled this past year to work with so many innovative companies from Western and Eastern Europe, Scandinavia, and Asia. As we anticipated nearly a decade ago the center of innovation would no longer be dominated by Silicon Valley but expand globally as countries created their own entrepreneurial ecosystems. While most countries have a ways to go to reach Silicon ValleyÔÇÖs level of maturity weÔÇÖve been especially impressed with innovations from Eastern Europe and Asia where their cost advantage combined with innovative technology either creates new markets or disrupt existing ones. An article from McKinsey Quarterly explains this phenomenon quite well. Essentially new competitors unencumbered by insular thinking and functional disconnectedness are more tuned into their customers and more nimble. Some companies are rising to the occasion through more focused collaboration internally and greater emphasis on what customers truly value. These great case studies illustrate how some companies have overcome their deficiencies to establish market leadership. A recent article from MIT Sloan Review highlights how many emerging market entrepreneurs have innovated by creating a cost advantage that comes on the back of a business model that is not only different from, but also conflicts with the business model of the established companies. This type of disruptive model is much more sustainable than just cost advantages alone. A recent study from KPMG cites that countries which were never part of the technology innovation map are taking center stage. Tech innovative companies Apple, Google, Facebook, Microsoft, Amazon and Samsung are being joined by upstarts from emerging economies such as Tencent and Baidu from China and Yandex from Russia. Visionary technologists like Masayoshi Son from Japan and Jack Ma from China are getting in the headlines. As you think about your product pipeline and where to source new ideas, you might want to keep tabs on new competitors in Europe and beyond. Check out this infographic on venture backed companies in Europe. And as reported in the KPMG survey, Innovation is unfolding in other parts of the world. China, in particular, is investing to be on par with Silicon Valley. The US is respected as the worldÔÇÖs technology innovation center, but as technology innovation becomes more global other countries are gaining momentum to become technology innovation leaders. Stay ahead of the game and maintain or improve your global competitive advantage. 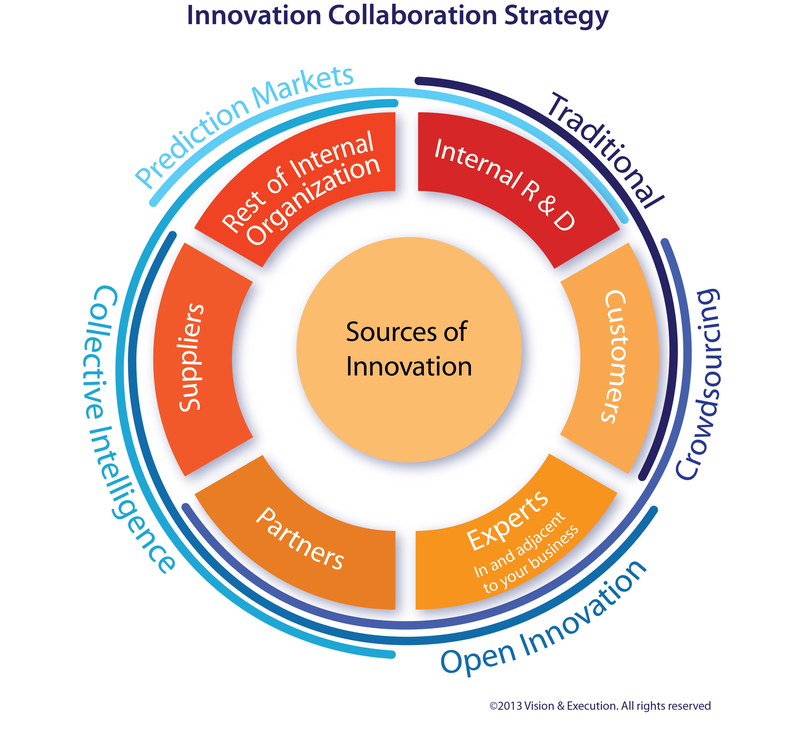 Vision & Execution can help you apply our Innovation Collaboration StrategyTM to your innovation process to enable you to create your own disruptive solutions.